The white winged lion sanctuary watchkeeper, who dreaded the spread of the Abyss. The Sanctuary Guardian is a huge manticore guarding the entry to Oolacile Sanctuary. It's a powerful creature that functions as the first boss of the DLC area, and a hint for what's to come. * The boss itself will not respawn, but after defeating either Manus, Father of the Abyss or Black Dragon Kalameet there will be two respawning Sanctuary Guardians in the garden. They give 3000 souls each when defeated, and do not drop any weapons. It is not advised to fight both at the same time, or really to fight them at all, as you are effectively fighting two late-game bosses simultaneously for little benefit. 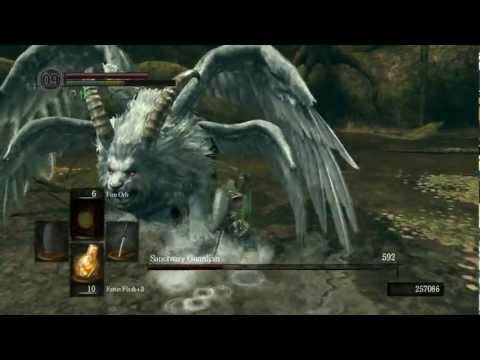 If you missed the tail weapon on your first run through, however, you can try for it again; preferably by taking one down with arrows while inside the tunnels connecting to Sanctuary Garden, though this is time-consuming and will aggro both of the manticores. Fury Attack, it attacks two to four times in rapid succession, this can be blocked or avoided by backing away. After the fourth attack, you may safely hit the beast once while it regains its stance. Wave Crash Attack, the Guardian slams into the ground creating a slow-moving shockwave, which drains all of your stamina if you are blocking and staggers the player. Followed by a charge attack or Lightning Shot, depending on how far you are to the boss. You can easily roll to the side of it or roll forward if you are close to the Guardian to avoid the wave and counter. Usually followed by Best moment to Flask up. Lightning Barrage, the Guardian shoots three to five charges of lightning at the player. Bear in mind that this causes splash damage if you stand in the water. Avoiding both the shots and their AoE can be easily done by circle-strafing in the same direction for the whole barrage. Lightning Shot, the Guardian shoots a charge of lightning at the player. Beware that rolling the moment the Guardian unleashes the shot won't be enough to avoid it. Flying Lightning Shot, the Guardian leaps into the air, firing a charge of lightning at the player, while flying straight over the player or half-circling him. Poison Tail Attack, the Guardian swipes with its tail if you stand behind it for too long. This causes heavy poison. Hoof Kick, if standing too long behind the Guardian, it will kick its hooves at the player. It's the chopped-tail version of Poison Tail Attack. Horn Bash, the Guardian charges the player with its horns. This is blockable or avoidable. Rolling will give you a chance to cut his lowered tail. Flying Horn Bash, the Guardian will flap its wings and dive to the player. The attack might be blocked or dodged with a roll. Rolling to the side is the best way to cut its tail since the chimera will lower his tail to the player's reach, recover its breath and have its back turned toward the player. Flying Tail Whip, the Guardian will rise in the air and dive towards the player to whip his tail at the player's face to rebound behind him. This attack can be blocked, although it is difficult to notice the first time. By holding your shield up and backing away, the tail will hit your shield rather than your head. The fight is relatively easy if you have fast reaction skills. When you enter it will most likely let out a roar and use Lightning Barrage against you. Just sprint/roll to the right to avoid this. Walking with low Burden is a much more effective way to avoid since it's fast enough to evade the barrage without expanding stamina. Lock on to the Guardian and keep your shield up when you move forward, as it may start bashing immediately. Try to keep to the side of the monster and just wail at it with a relatively strong weapon. I did it with a non-leveled Gravelord Sword at level 59. Be wary of its' poisonous tail if you don't want to destroy it to get the drop. Pay attention to its' leaps, as it's easy to lose your Lock-On when he does so. NG+: Lightning attacks can be avoided by sideways moves, physical attacks can be avoided by walking backwards, then counter-attack. He has a wave which destroys your block and is followed by a direct attack, so the best would be to avoid the wave with a fast side-roll, though I can´t confirm that, [Linkkit92 on NG, less than 50% burden: the moment I saw the lion standing on its' hindlegs, I rolled once on the side and avoid the wave completely. However, a Lightning Shot followed most of the time] played a >75% equip load tank, with which the unblockable damage was bearable on NG+, about 500-750 dmg. His tail can only be hit while it rests on the ground, and this only happens after his charge attacks. There are two kinds of charge attack, one where he flies up and then dives down, and another which is a followup to his Wave Crash Attack. Normally people avoid this latter attack by rolling to the side, but the best way to generate more openings to hit his tail is to actually get hit on purpose by the Crash Attack while not blocking (as it will not drain any of your stamina nor deal damage); if you are close to him the beast will then lower his head, preparing to charge - and fret not, he doesn't do this too fast, so you will be able to recover from the stagger and still be able to roll and dodge the charge. Later, when there's two Sanctuary Guardians, equip a bow and go buy a few hundred normal, run-of-the-mill arrows. Warp to the Sanctuary Garden bonfire, and ease up the tunnel and take a shot at a Guardian's tail when a Guardian is visible. They will both attack, and if you're standing too close to the tunnel mouth their lightning attacks can still hit you. Back away until you can usually see the tips of their wings and nothing else. They'll try lightning attacks most often, but they'll regularly run up to the entrance of the tunnel and keep running for a few seconds before they turn and move back into the arena. The stinger of the tail is in plain view and stays in relatively the same spot. Just shoot it with an arrow every time one of the Guardians does this. With patience and positioning, this is a surefire way to get a Guardian Tail, and shouldn't take too many arrows (Doing 150 damage per hit, it took 20-30 arrows on first playthrough), the spares are just in case of misses and in case you want to do it again on the other Guardian.